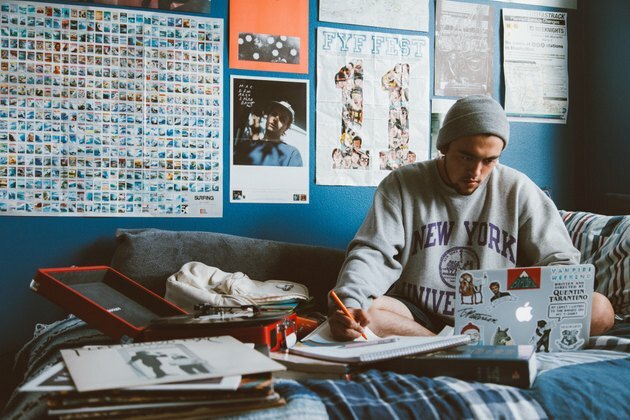 If you're about to begin your dorm life — or you have a family member who is — my best advice is to think through which items you will actually use on a daily basis. In collaboration with Wirecutter, a New York Times company that reviews and recommends products, here are four cheap (ish) things to help make dorm life more comfortable. LAUNDRY BAG. Unfortunately, doing laundry in college often means running back and forth from the laundry room to make sure some impatient students didn't dump your clean clothes on the floor so they can start a new load. Having a sturdy laundry basket with handles makes carrying everything easier. Wirecutter recommends the Sterilite Stacking Laundry Basket because of its ability to hold a week's worth of clothes. MATTRESS TOPPER. I wish I could tell you that your dorm comes with a soft mattress, but I'm afraid that's not always the case. Enter the mattress topper. Wirecutter's budget pick is the Dreamfoam Gel Swirl Memory Foam Topper. WATER BOTTLE. Carrying a refillable water bottle around helps remind you to hydrate and also prevents having to purchase pricey plastic bottles. The top choice from Wirecutter is the Klean Kanteen. TOILETRY BAG. Many dorms have hall-style bathrooms, so you might be sharing facilities with a group of your classmates. This means lugging your toiletry items around each day. Even if you're lucky enough to have a room with your own bathroom, these can still help keep your items organized. Wirecutter recommends the Sea to Summit Traveling Light Hanging Toiletry Bag, which has a hook to hang it up. What Are the Pros & Cons of Using a Washing Machine Without an Agitator?